I’ve been working on another room! In my house! Capturing some of the momentum from finishing the renovation work on my bedroom (well, mostly), I started working on one of the other most torn-apart rooms in the house a couple months ago, and have just been chipping away at it when I have time. This is the room, which we’ve rarely discussed here because it’s never really been a space I used! I think maybe the last time we talked about it was when I bought the house? At the time I called it the “middle bedroom” which is how I’ve continued to refer to it until now. 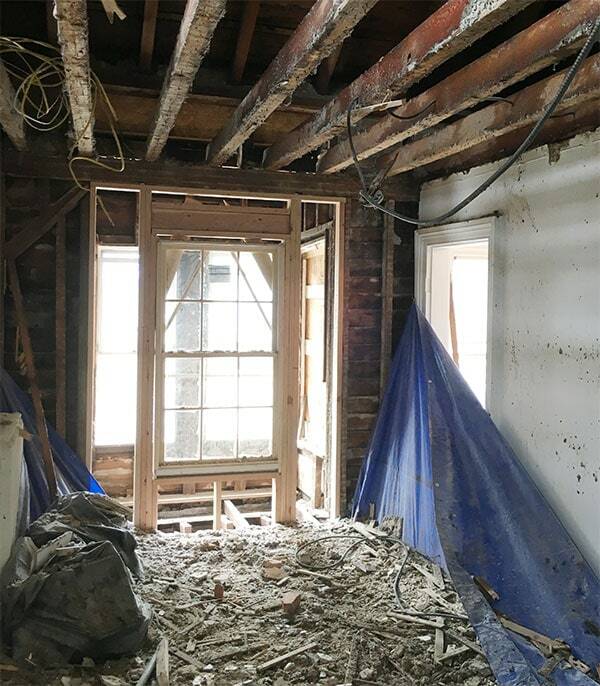 One sort of funny thing (maybe that’s not quite the right word) about renovating this house has been that even though it’s a pretty big house, it’s never felt all that much bigger than, say, my Brooklyn apartment. Much of the house is still unrenovated and not in use at all, aside from maybe storing stuff: the big living room, the downstairs bathroom, now the kitchen, the room above the kitchen, and this space. Some spaces haven’t been renovated but are chugging along in spite of that, performing their very basic and necessary functions. Until very recently that included the bedroom but also the only bathroom (it’s so bad, omg), the nursery, all closets, the hallways and stairs. And then there are the spaces that I have renovated, which can be difficult to maintain while other areas get renovated, such as the smaller living room, the dining room (which also currently houses the kitchen, haha), the laundry room, the little upstairs office, and now (thank goodness!) my bedroom! A lot of the more recent and money-draining work on the house has been dedicated to exterior projects, which makes a huge difference in the appearance of the house from the outside and affects the interior—especially when we’re talking about adding windows or demolishing additions—but doesn’t tend to immediately improve the inside of the house. In fact, in the case of this room, it turned it from unrenovated-but-serviceable to…ruins. So anyway. I guess what I’m really saying is three things. The first is that my life is a mess. The second is that while recovering from the fun and exciting financial strain of big exterior projects (and trying to save for upcoming things like the kitchen! ), getting some simple rooms completed that can be finished on a “paint and joint compound” budget has been a good strategy for me. Even if that means renovating out of order in terms of need—in case you were wondering why this is coming before the kitchen. Kitchens cost a lot of money but rooms like this don’t. And the third thing is that I’m almost at the four year mark of owning this house, and just starting to feel like I can…spread out a bit. Treating the house more or less like a much smaller apartment has led to things feeling kind of compacted and condensed—like using the bedroom as a place to sleep but also often as a place to watch TV, work, and eat. Increasingly there are separate spaces for doing different stuff, which just feels CRAZY. I used to have this recurring dream when I lived in New York, where I’d open a previously-unnoticed door in my apartment and find a whole other space behind it that I had no idea existed. It’s kind of like that, but in reality! To orient ourselves a bit, the room we’re discussing is #4 on the floor plan above, highlighted in pink. It’s a decently sized room (about 10’x14′), but it’s kind of tricky—you have to walk through it to get to both the little office (#3) and the room above the kitchen (#5). I thought for a long time that I’d make this room into a guest bedroom, but that’s also the plan for the room above the kitchen, and it’s pretty awkward to have to walk through a bedroom to get to another bedroom. A bed does fit in this room, but doesn’t leave much space to maneuver around it (which you have to do to get to the other two rooms off of it, of course), so I realized that a guest bedroom in here might be a poor use of space. Then it occurred to me: cozy den, please. One of my friends and fellow old-house-dwellers has a room on the second floor of his house that I like to refer to as the opium den. While the living room on the first floor is well-used but more formal, this secondary den space is where the TV lives, a big comfy sofa, a big upholstered ottoman, walls painted almost-black and covered in art and curiosities…it’s inevitably where the party ends up at the end of the night (not coincidentally, it’s also the room in the house where you’re allowed to smoke pot), and just a super cozy space to curl up, watch a movie, and eat chinese food. SO. Like every other space, this one has marched through some changes as the rest of the house has gotten some updating around it. The room-by-room strategy to renovating is a myth because of this kind of thing. 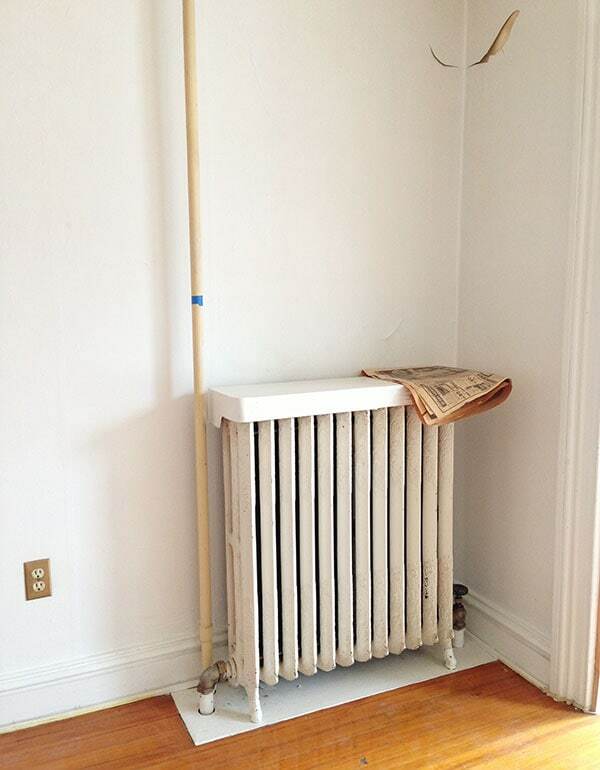 First off was addressing this radiator, which had this situation going on when I bought the house. 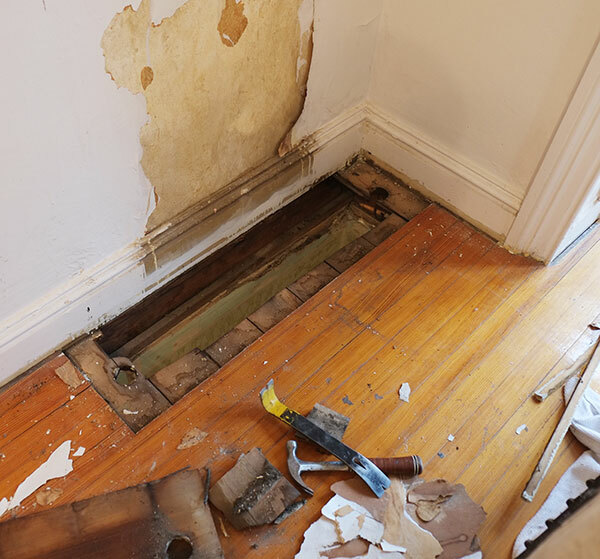 That vertical pipe was a remnant of an older heating system and could be removed, and the radiator supply and return pipes that once ran up the corner of the dining room were removed and buried in the wall. I like to re-route radiator lines through walls and ceilings where possible—this house was built before radiator heating (or indoor plumbing, for that matter), so even though the radiators themselves aren’t going anywhere, it’s nice not to not see the pipes all over the place. While the plumbers worked on re-running the lines, I patched in the floor! This is the only radiator in the house installed this way—over a painted panel instead of the flooring running below it, and I kind of wanted to center it on the wall (now I kind of wish I hadn’t), so anyway. The plumbers were sort of amazed to find that the whole subfloor had been cut out, too! And that the whole thing hadn’t ever come crashing through the dining room ceiling, since—newsflash—radiators are reallllllly heavy. Anyway—I installed ledger boards on the joists below, patched in a new piece of subfloor, and then feathered in floorboards over that. I used boards from the downstairs bathroom, which look totally different but are the same size and species of wood (douglas fir), and should look the same once the floors are eventually refinished. Someday. I didn’t worry about the two boards closest to the wall being feathered because the radiator sits completely over the seam, and I was rushing to get done before the plumbers had to put the radiator back! The room also got some electrical upgrades as parts of other projects, and then it sat for a couple of years. More or less untouched. Sad times. Then toward the end of last summer, some big things happened. Like this bay window going away. I know. I know. At first glance, you’re like—holy smokes, that’s awesome! What a fun feature of this room! I also had that thought. Slowly, over time, that thought was replaced by other thoughts—not the least of which being that the whole thing was constructed on top of the collapsing solarium, and that was probably bad should the solarium ever decide to give way. Also it wasn’t original to the house. Also it was in very poor condition—missing the windows on each side, a terrible drywall job to cover up water damage from the leaking roof above it, some creative use of 1x lumber, noticeable settling…this was all done before I bought the house, and none of it was good. It also just felt…strange. I think because it wasn’t original to the house, this room isn’t really big enough to handle it. It felt proportionally totally off. And looked like a tumor on the exterior. So we cut it off. Kind of. It was slightly more complex than that. You can read about it here. Then we framed in the new window. I tried to do as much of the exterior work from inside the house as possible so that I could minimize the amount of time that anything would be exposed to the elements or looking a damn mess for the neighborhood. But look! I like this view because—really—it’s how the house is supposed to be. The way this new window lines up perfectly with the adjacent one in the little office feels emblematic of the organized way that a neoclassical house is designed and constructed. It looks right from the outside and feels right on the inside. Once that wall was taken care of (structurally at least—clearly there is still work to be done! 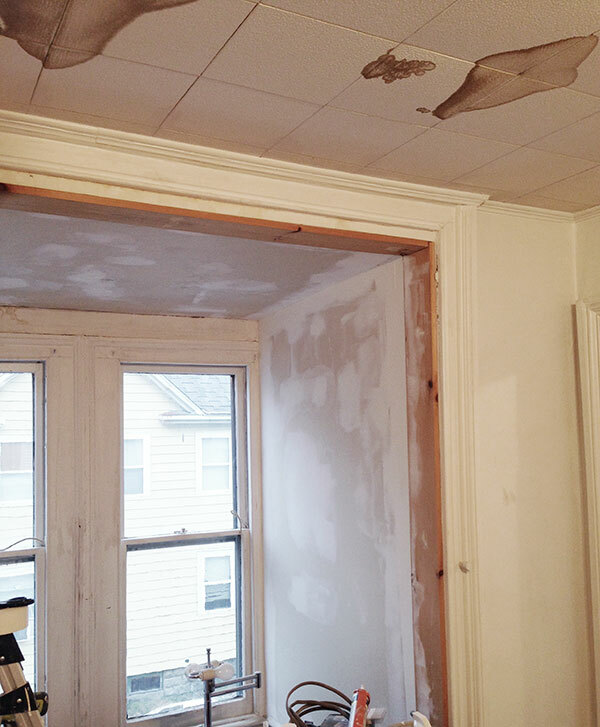 ), we got a little demo-happy and ripped down the ceiling. I hate demo’ing plaster because it’s a horrendous mess but also because plaster and lath walls are better than new material options in a number of ways, and once it’s gone it’s gone. Unfortunately this ceiling had furring strips nailed into it and acoustic tiles installed onto those (likely installed in the 60s, when the original ceiling was probably showing signs of failure), and pulling down the furring strips tends to take a ton of plaster with them, at least in my experience. Of course, there’s blown-in cellulose insulation between the second floor ceilings and the attic floors, which is only really a bad thing when you have to rip out a ceiling and you don’t want all of it to come down with the ceiling. So the solution Edwin and I came up with was to take up the attic floorboards over this room, shovel out as much of the cellulose as we could into big contractor bags (BOY WAS THAT FUN), spray it all down with a garden sprayer to contain some of the dust, and then demo the ceiling as normal from below. Also, it was kind of nuts to be able to see the underside of my roof at this phase. After some major clean-up, we put down new 3/4″ plywood subfloor in this section of the attic. 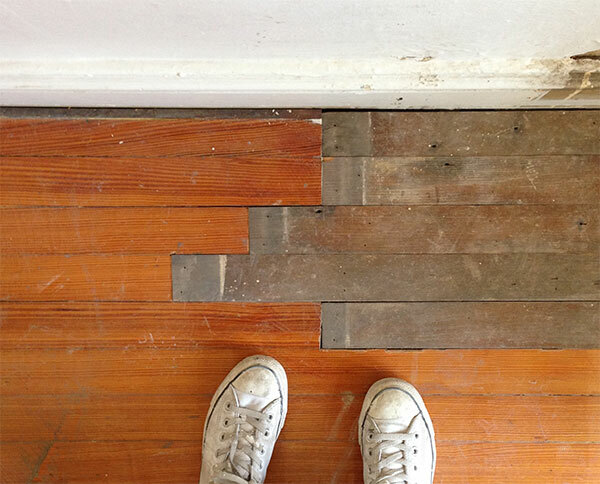 The original boards are all varying widths and some cracked or splintered during removal, so re-laying the original floor is a project for another time. Also because I’m crazy I can’t guarantee this will be the last time I have to remove sections of the attic floor, and I’d rather be messing up new plywood than precious 150 year old pine planks. This! Which I know looks like a sad, sad state of affairs but really represents a huge amount of progress! Framing is done, new attic subfloor is in, new electrical is run, and the reconstructed exterior wall is insulated (ceiling insulation comes next! )—so now the fun work begins! This room has a little bit of everything: carpentry around the new window and patching in the baseboard, new drywall work, plaster repair and skim-coating on the remaining three walls, and of course painting and furnishing and all that child’s play. So here’s an idea of what I’m thinking! That’s the wall color in the upper left hand corner, followed by the trim and door color. I think I’m even going to try to paint the ceiling the wall color too and see how that goes! I’ve tried a couple times in the past—unsuccessfully—to paint a ceiling super dark and it’s never looked good, but I think this room will turn that streak around. Then we have another new medallion and another black radiator. The light is just something I dragged off the internet and then turned pink in Photoshop, but I do have a vintage light fixture with pink glass shades that I’m so excited to use! The sofa is also a Photoshopped version of this sofa from Roger and Chris, which is just sort of similar to the sofa I’m getting from…the Brinson’s! I’ve recently become friends with fellow bloggers and upstate NY dwellers Susan and Will, and they’re getting rid of their big boxy super-stuffed leather gigantic mass of a sofa, and something tells me that Mekko is never going to leave it. Then my little bright blue Eames rocker (which hasn’t been used since I moved from Brooklyn! I missed it!) and a side table I’ve hoarded for a few years from JC Penney, which was part of the Terence Conran collection and I bought when it went on sale, even though I didn’t know what I’d do with it! Sometimes you just gotta! Then there’s the Rise Floor Lamp and Balla Sheepskin from Article (this post isn’t sponsored, but they did provide those two products for an upcoming post that will be), and another old oriental rug because that’s how I do. Yay, opium den! Let’s do it! Hi guy…..for sure your house needs an opium den….what house doesn’t? I’m scared to think what the ceiling and walls will look like so dark but you might just make it work….can Edwin come over to my house?…my front porch as decided to “separate” from the rest of the house…yikes. Yikes indeed! I think TO might be a *tad* outside his geographic range, but best of luck getting it addressed! Sorry that’s happening! We need a shot of the window from the outside. I guess I could scroll back, but not sure I’ll figure out the right one. I also have that dream about opening a door to a forgotten room. All the time. Several different rooms, never the same. All the same, I’m glad I don’t have them. Too much to clean. When I lived in smaller apartments, I’d have those dreams all the time. For some years, it was the same dream all the time – a door that opened to reveal not one, but three(!) extra rooms. Once I moved to bigger apartments (the last four have been over 1000 sq. ft., so really quite sizable for one, in big cities anyway), I stopped having those dreams. After we moved back to Texas from three years of living in a 975 sq. ft. apartment outside of Philadelphia, I often dreamed that my friend (who lived in an identical apartment), came over and showed me all the hidden closets. The funny thing was, that apartment had SIX closets, three of which were large walk-ins. Our 1660 sq. ft. house here in Fort Worth (built in 1943), has only three closets, although one is a large and unusually shaped walk-in lined with cedar planks. Opium dens for all! Hahaha. I LOVE your blog. I seriously read each of your posts word for word. It’s all so interesting. I live in an old house but could never imagine doing all of the amazing things you are doing on my own. So excited to see how this turns out! Exciting! A place to relax will do wonders for your sanity, I’m sure! I too love following The Brinson’s and maybe you can get a little dark ceiling inspiration/help from them since they seem to be masters at it. I’m so envious of their new wallpaper! 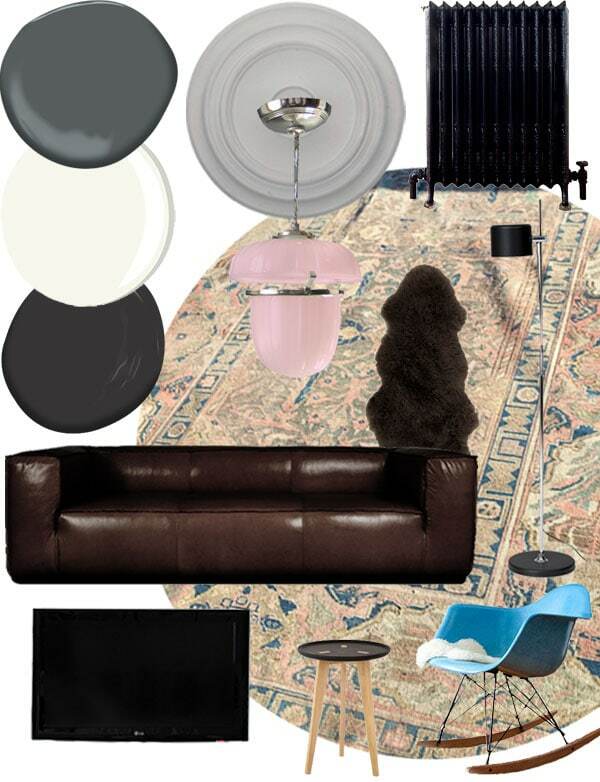 Also loving the idea of a pink light in that room to play against the dark walls and masculine sofa. They are great at it! I saw the room they’re working on last week and it’s amazing—the wallpaper is outta control! And I’m dying of jealousy a little over the refinished floors…they claim it was so easy and now I want to do mine, like, yesterday! CEILINGS ARE THE WORST. I also had acoustical tiles over plaster and lath, with some drywall and a drop ceiling thrown in for good measure. Tearing it all down was so awful while it was happening, but it was worth it. I have cellulose insulation over a drop ceiling in my second floor sunroom that I’ve been avoiding dealing with, so I’ll have to try your shovel + spray bottle method once I mentally prepare enough for the debris. Ouuuuch! But good for you on keeping the original ceiling height and getting that plumbing fixed! So worth it, but yes…plaster ceiling demo is no fun ever. Take your time on that sunroom, ha! When we had one of these in the rental house we were living in, we called it The Zen Room, ala The Rocky Horror Picture Show. Ooooh, I do love a nice dark masculine feeling room. Not for a whole house, but definitely for a snug. It sounds super awesome. I think it’s gonna be reallllll cozy! I can’t wait! Haha, I’ve never heard “snug” used to describe a room! It’s so cute! Opium Den – yesssss!! Seems like the absolute perfect use of that space. Do you still use the tiny office? Also, please give yourself a major pat on the back for the incredible amount of patience you have for working on your house in this way. This really is a major restoration and there is a lot to do. The pace and your thoughtfulness about it is really allowing for such great decisions. But it also must feel difficult some times. So serious kudos to you for making progress and giving yourself some more breathing room. Thank you so much Jessica! That’s very kind—the pace of all of this definitely makes it a challenge, but I’m also so thankful for it…I feel like I would have screwed up a lot if I had been able to do a big renovation before ever moving in or something. And yes, the tiny office is still in use, but I think not for long! That’s where laundry is moving so I can maximize kitchen/butler’s pantry space. Also because I’m a lunatic. I’m already picturing a cosy smoking room with a wood book cases, persian rug, and that leather couch, dark antique green walls. I can’t wait to see the end result! Here here! Although the walls are more of a charcoal-navy kind of deal (Benjamin Moore “Flint”). Dark green was also a contender! Yessss, I am so excited for the Opium Den! In fact, I’m pretty sure I need one, too! I know it would be a chore with the trimwork, but have you considered widening the doorway from this room into the hallway? Hear me out… As a den, this is going to be a “public” room, and since it’s likely to hold a number of people at times, it will go from cozy to stuffy and over-crowded quickly. I think you can create a space that works on both levels by widening (and centering) the doorway and (drumroll please) using pieces of the controversial GLASS PARTITION from your big livingroom in the space. You could use both doors, or one door and several panels as a sidelight. The glass is heavily pebbled and would obscure the hallway enough that you wouldn’t loose the cozy factor; the door could be opened wide when hosting a crowd for better airflow and less claustrophobia; and you’d get more light into the hallway everyday. The partition isn’t original to the house obviously, but it’s old enough to have a funky vintage charm, and would seem like a reno that happened 75 years ago. One other thing I’d think about is moving the doorway into the back bedroom closer over to the corner by the bathroom. Large furniture placement is going to be a bit challenging, and that would give you another long wall to play with, and minimize the pathway into the bedroom. In any event, I continue to be impressed with both your vision AND your work ethic. Go you! I was wondering about widening that doorway also. Love your suggestions Amy! I aso had this thought – first about possibly opening the wall from this room to the hall with a wide archway, as you sometimes see in spaces at the top of stairs flanked by bedrooms used as other than bedrooms. But then I thought that sometimes for noise control, it is nice to be able to close the doors to the late night tv/party room so it doesn’t travel to others who may be trying to sleep elsewhere in the house. (Also useful when the open room is a study or guest sleeping space – then that inhabitants of the room may want a door to keep noise out. Then I thought – double doors in the opening one could close. But, of course, this would limit any furniture placement on that wall, unless the doors were pocket or sliding doors. I hadn’t thought about using the large living room glass, which is an interesting idea. With a wide opening and no doors, or use of glass ones, you could incorporate the hallway space into the space of this room functionally and/or visually. I would also suggest considering brown or navy in addition to something that reads as black on the walls. I moved into a place with some brown rooms that I hated at first, but then came to like a lot once I decorated them – my initial thought that I needed to paint them something lighter went away and I came to like them, as they were cozy at night. And since they got a lot of sunlight (a ton), they were not dark during the day. I don’t know which way the window faces or how light this room is, but I think the blackish walls may be too dark and not read as cozy as you will want. I also think dark wall OR ceiling, but not both, might be best. Finally, if you want to have extra sleeping for those times when you have overflow guests, I’d advise getting a sleeper sofa for the den room – comes in handy when you have a lot of guests at once. Oh, I get that, there’s a limit to what one can do, and often that’s a really good thing, because there’s a fine line when people start changing layouts to where the old house feeling of the original house can get lost – so I get totally you liking keeping it intact. That said, it would be really interesting (for many of your readers) to see what you came up with as a better floorpan – for those of us experiencing your renovation vicariously. A Den???? No. No. No. Call it a study, or the library, or the smoking room. But not a den. Den’s are one step above a rumpus room with wood paneling and bean bag chairs. And yes I am joking but a tiny part of me just abhors the word den. Thank you Chris! I have too many rugs but I just can’t pass up a good one for a deal! You answered my comment (about bluestone cottage) on your post! I’m flattered! Congratulations on getting started in another room! Haha, oh good! We’ll get back to it, really really. The Opium Den looks very cool, and really is the best solution to a pass through room. I definitely think you should paint the ceiling! I am about to paint my bedroom navy, but I’m leaving the ceiling white. Although I did just buy one of Abigail Ahern’s books, and she is a staunch proponent of dark colours on the ceiling, so we’ll see! PS If don’t often comment, but I do read your blog faithfully (and the comments, hi everyone!) – you write so well! I’ve had great success with painting the ceiling a lighter tone of the wall color. Even if I want the ceiling to appear white, I use the palest possible version of the wall color. It reads as white, but the pulls the room together so much better than an actual stark white (or, god forbid, cheap, flat ceiling paint). And If I want the room to be more “moody” I go just a bit lighter than the wall, so that the ceiling feels like it carries the wall color, but isn’t quite so heavy as the fully saturated color. Thank you Caroline! Some of these comments have good suggestions for painting ceilings dark! I think it could work great in a bedroom! Not very well, that’s how! Have you thought of making #3 into a half bath for bedroom #1 (moving the door, of course)? The plumbing would be just above your once and future kitchen, I think. That would be my temptation. I also like Amy’s idea of widening the door to the den (btw, nothing wrong with the word “den” — an old world that hearkens back to our paleolithic bonding with dogs, so perfect for you and yours). Dark and moody…. Love it. We painted our living room ceiling black (with white walls) and peoples initial reaction is WTF?, but then when they see it, they always say, Wow, it really works in this space (the 10′ ceiling height helps). Totally works in your space! Also, gimme that chandelier. so much room to spread out… all those rooms ! i have only lived in small big city apts and have that dream constantly … although now its about a house since i am in a railroad apt with five tiny rooms but at least its five separate rooms and a good size studio/workroom in the basement and a patio and garden. its the size of the actual living space that is small.. not as bad in the spring and early summer and fall when i basically live on my patio and in the garden. but still i dream of an old house… not in westchester ha ha ! so vicariously read you and Yellow Brick Home and others.. sighing. anyway, i agree with the opening of the door to more of an archway entrance and the idea of moving the ‘guest’bedroom door over. and thanks for another good blog to add to my list! I love that your guests will have an entire suite when they visit! I’m doing the same at my Queen Anne, though with the old master bedroom. With a great big Western exposure bay window to watch the sunsets and catch the breezes over Bellingham Bay, I could never figure out why the previous owners used It as another living room…until I realized the street noise, train whistles, and rowdy WWU students would drive anyone to quieter, more cozy rooms in the back. It’s just so much better as s hangout//legal-in-Washington-consuming-space. BUT: Hookah coals ruin floors! There’s nothing like choosing between burning your hand or watching your floors burn as you’re frantically searching for the coal tongs (thanks, klutzy drunk friend). Be ye warned! Are you keeping any of the old upstairs kitchen plumbing? Given the distance to the kitchen, a sink might be nice for guests if they want a glass of water, or for brushing teeth or makeup of they’re waiting for the shower. I have faith that the dark painted ceiling will work this time! And with a couch like that, if you ever have a full house, the “opium den” will still make a decent guest bedroom in a pinch. Yes! Susan told me that the seat cushion is essentially the size of a twin sized bed, so perfect for someone that needs to crash! At least until there’s a proper guest room. Since your cozy wee office is now destined to be a laundry room with wallpaper so gorgeous I’d want to wash clothes daily, will a corner of this den eventually house your office? Or do you plan to put that function elsewhere? This room is gonna be so good. Oh, I forgot the laundry room is going upstairs since you are creating a pantry. I agree it is more useful upstairs. Is the little office set as its location, or are there other possibilities – and are they determined by where you can put plumbing lines? Thinking about where I’d want a laundry room in this upstairs, I gravitate to the back bedroom near the bathroom. I don’t know why, I just do. I’m not at all convinced that this room makes the best bedroom or guest bedroom – I think of it as a much more utilitarian room, and whatever it’s use (extra closets maybe, as all those linens and comforters for multiple guest rooms have to be stored somewhere, as I’ve discovered) in addition to other uses – I would put my sewing machine in there, other would put their crafts or small house project desks – you could have a sort of private office/design studio – whatever you use if for, I’d think about incorporating a laundry into it, maybe not as a separate room, but as an area of the room, with laundry machines that could be hidden by something – like a curtain, closet doors, halfwall, cabinet doors under a counter/workspace over them. I think the little guest room at the top of the stairs is way too nice a room to make a laundry room, and I’m not convinced the little office room won’t be off of a bedroom or room used as guest room sometimes, which makes it not ideal for laundry – perhaps if it opened to the room you now use as your bedroom if you used that as the study/den room, then it might be good for laundry. And here’s a crazy idea, which you’ve no doubt had. You’ve got a chunk of space that could be combined (or divided up) into more usable space if you combined your bedroom closet, the little office and the stairs to the attic. How strongly do you feel about having an actual staircase to the attic? If you created a pulldown ladder access panel to the attic, in the hallway or in some other room (ideally one in which the floorspace the ladder would need wans’t completely taken up with a bed all the time), you’d have a whole more section of second floor space to use on for things like a laundry and what I (for me anyway) see as definitely-needed additional closet & storage space. Given that you have a basement, I don’t see you storing a lot of stuff in your attic. Nestfan—I’m pretty sure I’ve thought of it all at this point, haha! I wrote a bit more about it in response to Amy L above, but basically…it just doesn’t make sense for me right now to take on the major time and expense of shuffling around perfectly good walls and doorways as long as it’s just me (plus or minus a boyfriend, ya know) living here. 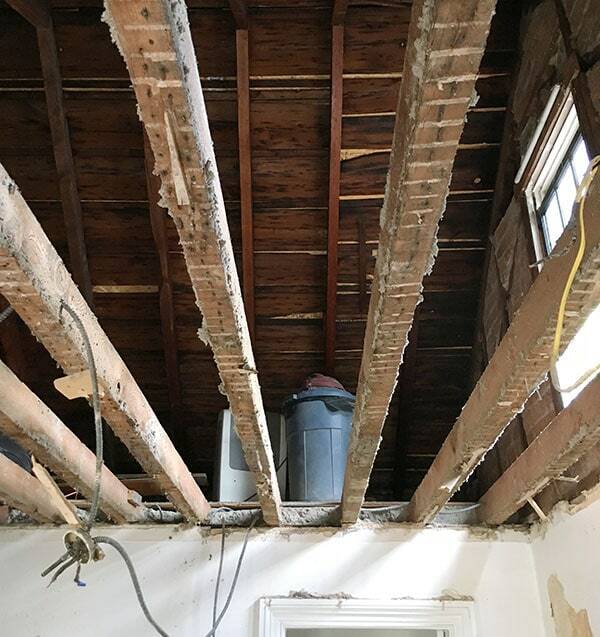 But yeah—I’m pretty opposed to ripping out the attic stairs…they’re so cute, and I CAN see the attic getting converted to useful space someday, and then the lack of stairwell would be problematic. I have a whole plan that I actually really like that would involve moving a fair number of walls and doorways to create a more workable three bedroom plan up here (still sensitive to the era, still with a full attic stairwell), but I’m MORE than fine with leaving that as a mayyyyyyyyybeeeee someday option. Didn’t realize the attic was tall enough to get usable space out of – that’s cool! – a whole new for to get around to someday – if you have the energy left after tackling everything else on your plate in this house. I think I got it – the imaginary better layout that doesn’t wreck the feeling of the house – you rearrange the bathroom fixtures so that the bathroom is smaller, the hall can be extended, which allows room for there to be a door from the back bedroom directly to the hallway … or maybe not. I get why you don’t feel the need for three separate large bedrooms here and just want to make some more rooms usable. 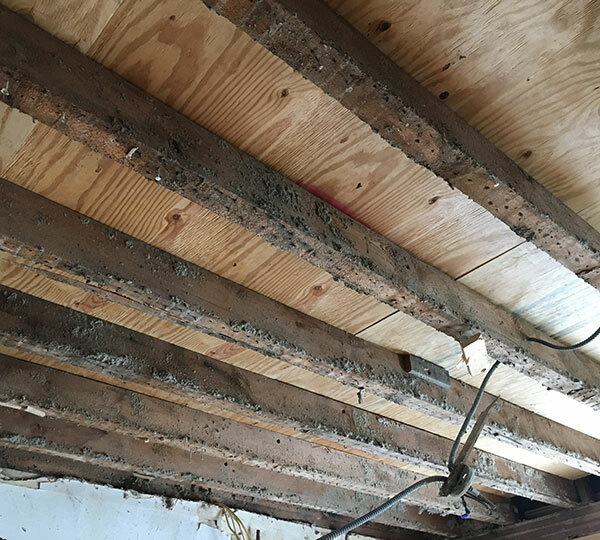 It really is amazing the work you’ve done tearing off additions to the back and side of the house and completely residing them – it slowed work on the inside, but your house seems like it can breathe now with the adhesions gone, so it will be so worth it. Gillianne—thank you! Honestly…I don’t know about the office!! I use the office sometimes, but honestly I’m not really a sit-at-my-desk-and-work kinda guy. So maybe I don’t even need one, just a place to store office-type things? I don’t think there’s really space in this room to fit an actual work space, but it will be a nice space to work in. Sometimes I think about making the “nursery” room into an office space, or maybe the room above the kitchen, OR maybe the living room on the first floor once the larger living room is renovated and furnished. I don’t know! 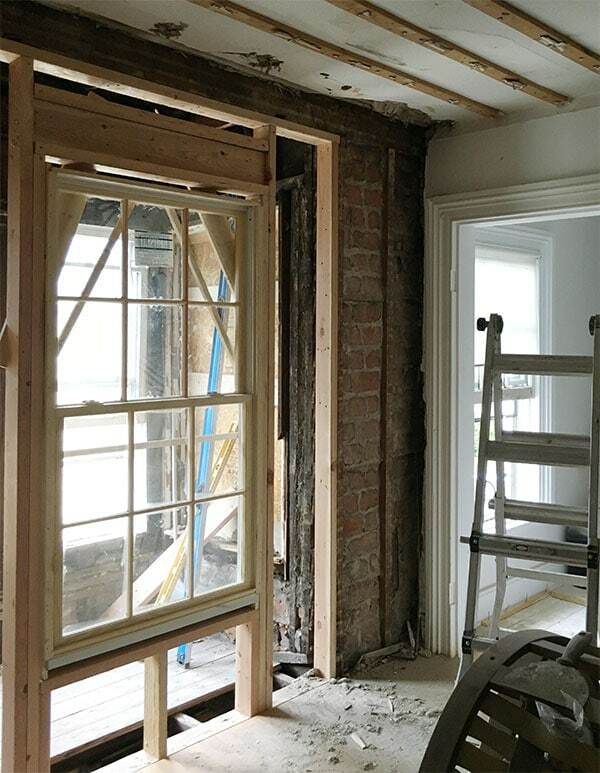 It will be a gorgeous sitting room! What vision! p.s. I love the dark walls, I would tend to do a ceiling just a shade or 2 lighter rather than matching. Because the ceiling will always look darker from shadow. Also, I really like to see the definition between the plane of the ceiling and the plane of the walls. Even without crown molding (unless you do crown molding!) I like a nice clean definition. With it being all one color it almost rounds out the room.. I think I might be OK with that! I want kind of a cave! I’m confused by the part where you said you wanted to center the radiator on that wall – and then wish you hadn’t – had you already run the plumbing so the radiator would be centered? It appears not, as the patched part of the floor where the radiator will sit is its original location, no? And the door to the back bedroom is in the center of that wall, no? Maybe you were planning to move the doorway over. In any event, for heating, the radiator is best left where is it, close to the window/exterior wall, isn’t it? Have you thought about taking a corner of this room by building little walls so the entrance to the back bedroom can be direct from the hall? So the door to the back bedroom would open to the right against an added |__ shaped wall where the door to this middle room is now, and then to your left would be the doorway without a door to the back bedroom.) This would make the rooms function independently without having to walk through one to get to the other. It could be done without messing up how this middle room looked if the rest of the radiator wall (beyond the little wall built to carve out the square removed to provide doorway access to the rear bedroom) was done with a built-in — a wall of shelving with perhaps doored cabinets below (with room for the tv you want in here, of course), incorporating the radiator into the built-in with a radiator enclosure as people often do. (Or the same effect could be gotten using any free standing furniture in the nook that has now been created on that that wall between the new little wall and the radiator, even a small sofa.) This implies that you would still have a new separate doorway further along that wall to access this middle room from the hall. Or, more complicatedly, you could have an open doorway from the hall where the door to this room is now and have a door on each side of a little carve-out from this room, the door on your left opening to the back bedroom, and a door either on your right or right in front of you opening to this middle room. That said, while it is nice to be able to have separate hall access for each potential room, it can also be nice to have a second door in a room so rooms can also be connected. My last place had a door between two bedrooms (so my office and bedroom could be connected, but they also had separate other doors) and my guest room had a door to both the hallway and to the living room – so I aways left that door open when I didn’t have guests and it functioned as a den connected to the living room. (I found the latter more useful, as I rarely used the doorway between my office and bedroom.) Having two doors in a room limits how much furniture you can place in a room, but it can also really add to the layout, depending on where the doors are located and how you use the rooms. 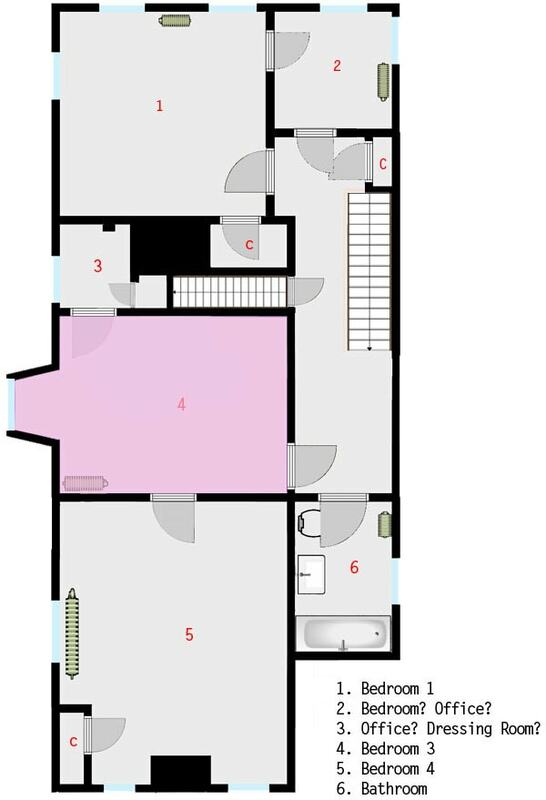 Lastly, if you really want a tv/den/party public-ish room on this floor, you might want that to eventually be the room you now have as your bedroom, as it seems to be the largest of the bedrooms, and also has more windows – so it gets more light when used during the day. The extra space in there would allow that room to function as a tv room/den and also as a second guest room with a good sofa bed – the room wouldn’t be crowded by these dual functions as the middle room might be. I’d be thinking about how I’d want to use that huge room as part of my decisions about the upstairs rooms. I’d also be thinking about where you want to work on stuff, with shelves and file drawers, and desk, and sofa or chair if you prefer working on those to sitting or standing at a desk sometimes – as I’d be looking for an office or study room, or area in a room, for a study that was much, much larger than the little office is – I know you aren’t used to having that, but with all this space, at some point you will want it. It could be in the tv/den room, in a room that doubles as a guest room with a sofa bed, or in one of your living rooms – I’d be tempted to have my main work area on the first floor, as I like being able to work and also keep an eye on stuff cooking in the kitchen, and be able to grab something to drink and snack on while working without having to climb stairs. It’s also nice to have such an area on the first floor as you continue designing and have clients come to your home office. I believe he means that he centred it between the window and the corner, which would mean only moving it along a little (right next to the power outlet?) so about half of it was still covering the patched area. Sorry, I meant center the radiator between the corner where it was and the doorway to the upstairs kitchen. Basically move it over about a foot. And yes, radiators are better on exterior walls or near (or, I think preferably, under) windows. I just didn’t know that at the time, and the plumber never brought it up! NOW I wish I had rotated it 90 degrees so it was tucked to the left of the new window, but at the time that wasn’t an option because of the bay window…ANYWAY. I could always be done through the dining room ceiling…just not in any rush to start tearing THAT apart again! I get what you’re saying about adding some walls to create a hallway to the back bedroom, but the room just isn’t big enough. It’s only 10′ across, so it would just eat up the whole room. That’s what the nursery is for, haha! I love how the premise for this was that it was an easy project to keep you sane whilst working on bigger projects. Just going to rip the side off the room, put a new window, rip out and replace the ceiling then decorate. NBD. Hahaha, the absurdity of that did not even occur to me. BUT DOESN’T THIS SOUND FUN AND RELAXING?! My perception of reality is so warped. I have that dream too. Not often, but enough, over the years. Sometimes I’m really annoyed to discover I was sleeping! And… Daniel…is the light Mekko’s light? The princess light? Or are you so awesome at scoring that you have found more than one incredible pink vintage fixture? I am JUST THAT AWESOME! Pink lights for every room! 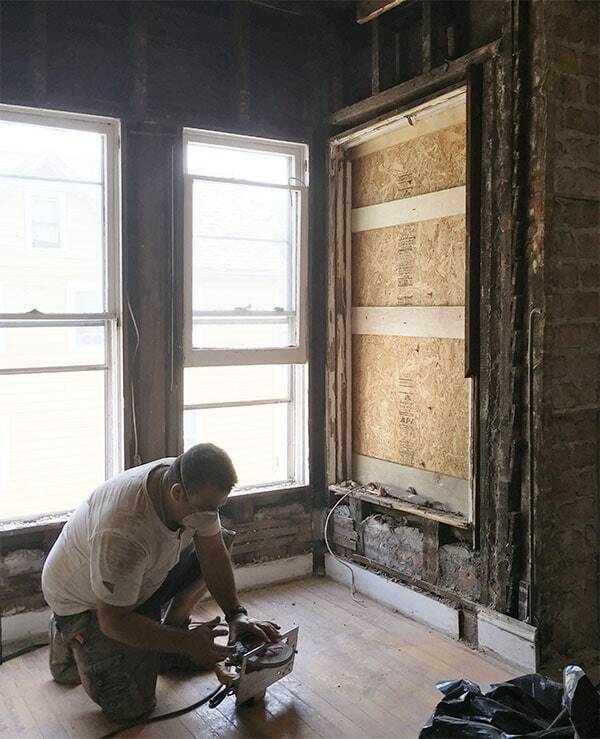 So, I have a renovator question–how do you stay motivated to do all of this stuff? I know that it folds into your profession, but I’ve been trying to renovate my home in LA and I can’t stay on top of everything. The house was built in 1925 and suffers from delayed maintenance, so while I scrapped the popcorn, removed the horribly stained shag carpeting and redid the wood floors before we moved in and have hired out a few things here and there to get repaired (sewer, the garage roof), moving on to painting the exterior windows and after that, I have just come to a total halt. Everything takes so long to complete and there is a long list of things that must be finished before I can start on the next thing, it is impossible to find affordable, quality help (honestly, some of the quotes I get back on things are eye-watering they are so expensive) and I’m just…ready to give up. You seem to have endless wells of energy and motivation to get all of this stuff completed, which is so admirable. Any tips on where to locate it?? First of all, this is hard. And very often, not very fun. And yes, expensive. And that’s ME saying that—a person who doesn’t have kids, doesn’t work a traditional 9-5 job, and can sometimes get a company to provide free products and services (and sometimes payment) to get various projects done or at least underway. I’m well aware of the privilege inherent in that. And it’s still a lot. It’s still overwhelming. It’s still a slow slog, and there are plenty of things that—in an alternate reality where I’m a more functional, financially stable person—would be done by now and aren’t. For me, the biggest thing I think has been letting go a bit of creating too much pressure on myself to complete really large tasks. ANY amount of work I put into the house—whether that’s installing sheetrock or just cleaning up—is going toward an end goal. All progress is good progress, and so I try to JUST DIVE IN because I know, ultimately, nothing will make this better than doing the work. And so I just keep plugging away. I create lists but break things down into TINY segments—painting the moldings in a room might be broken down into 10 different steps, and completing any one of them reminds me that thing ARE being accomplished even when it’s slow. I try to stay excited about what I’m doing, even if that means moving on from a space that’s not 100% complete because I’m just sick of it, and dedicate time to something that feels fun or easy or just more exciting. I touched on this a bit in the post, but it’s become more and more valuable for me to make sure I’m breaking up bigger projects with smaller ones—for instance, I spent all day Sunday building a cabinet out of reclaimed wood for under the TV in here, and yeah…I “should have” been installing downspouts or putting everything away in the basement or getting the yard ready for mulch, but this was more fun. And now I want to do more stuff. So as a mindset, that helps. You gotta keep yourself entertained and get quick satisfaction sometimes. For me, documenting the progress has a certain utility. It’s easy to feel like things drag out for wayyyyyyy too long while you’re in the midst of it, but if you work steadily on stuff, major improvements take place that are easier to appreciate when you can look back at how something looked a year before, a month before, whatever. And it’s FINE—healthy, normal, etc.—to maintain an awareness of all the many things that the house needs, but I think it’s also helpful to try to shut all that out every now and then to appreciate what you HAVE done, not all the things that need to be done. Does that answer your question, maybe? I don’t think there are right answers here, and I think it takes most people a long time to figure out what helps them. If anyone else wants to chime in, go for it! I love this answer. It’s applicable to so many things in life. It does actually. Thank you, it is nice to have the reminder that anything that I am doing is worthwhile and the little things do add up to the big things, eventually. I guess doing a DIY renovation is kinda like that old adage that authors say–“I don’t like writing the book, but I like having written a book”? Because I’m so glad that the things that I did are done, but doing them…ooof!! Thanks for taking the time to answer, I appreciate it. I’ll refer back to your advice when I want to give up in the middle of painting yet another thing that needs to be painted!! Oh LORD. I remember that Content by Conran table. I’m still kicking myself because I didn’t spend the $39 (!!!!!) that I would’ve had to fork over, with a coupon code, to get it in my house. And now, no more CxC. Sigh. On the other hand, I do have a Beep floor lamp AND a Beep table lamp. So there. I really love that you’re starting to branch out from all white walls. Curling up for puppy snuggles in this dark little nest of a room is going to be so amazing, specially in the winter. The thought of those dark walls is making me wonder, do you have any of that black and gold wallpaper from the little office left? Some sort of accent of that in here would be so swoon worthy! I feel like it would be interesting to tie the two spaces together with that too. I’ve also had dreams of discovering hidden rooms before! There was one recurring dream I had where the house I grew up in had a secret second floor that was an exact copy of the main floor’s layout, but with everything in extremely 1970s decor (which the actual house is definitely not). So weird. I do have some of that wallpaper left! I don’t think I want it in here, but since that room is right off of it I think the dark walls will tie things together enough. I think I love wallpaper too much to use the same one twice! There are just too many good options! Wow, I love this idea for that space! I was always wondering what the heck you could even do with it, since it connected to that other bedroom. A den is the perfect solution! And it is gonna be cozy as heck with that lovely wall color. Funny, I also just spotted a giant brown leather couch on a different site and thought, “Damn, that looks really comfy and awesome!” Which is a thought I never thought I’d have about a giant brown leather couch. Anyway, can’t wait to see the magic you’ll work in this room! Thanks Sara! I know exactly what you mean!! In my head leather couches are generally hideous, but I love these big boxy kinda-slouchy numbers that I think are having kind of a trend moment right now? If they are, I’m fine with that! Also since my dogs spend all their time on the furniture, I can’t wait to get some fine leather goods in here—bonus that it’s already a little beat up, and coming from a house with two big dogs who’ve broken it in nicely! And as always, I’m looking forward to more updates on this room and any others (go go tiny bar sink!). Your energy and motivation is outstanding! Is it the thought of seeing the entire house finished that keeps you going? I am completely lost as to the colors in this room. While you are working on the finishing work, can you get samples of all these paints and get them up on the walls somewhere? Just to look at while you are in the room working with the changing light, etc? I would be horrible to get some paint color up that you hate. Thanks greta! I talked a bit above about the whole motivation thing in response to Des’s comments, but short answer is partially yes! Getting these rooms to match some version of the vision in my head is definitely motivating, as is being able to use my STUFF that I love that’s otherwise just living a sad life of being stored and getting covered in dust. Don’t worry over the paint colors—it’ll be fine! Honestly repainting a room feels like some relaxing event nowadays…it’s all the work getting to the point of paint that would be horrible to redo! Are you familiar with the Mad About the House blog? She’s English, and writes frequently about different approaches to painting rooms in Victorian houses. You might get some good references to work from. I’m not familiar with it, no! I’ll check it out! love your opium den concept! have you thought about opening up the door wall into the hallway? i’m not sure how that would work for you structurally – but either turn the door into a wider opening (like double it’s current size) or taking out that whole wall entirely? this would make your hallway feel less like a narrow space of doors and provide some sunlight. 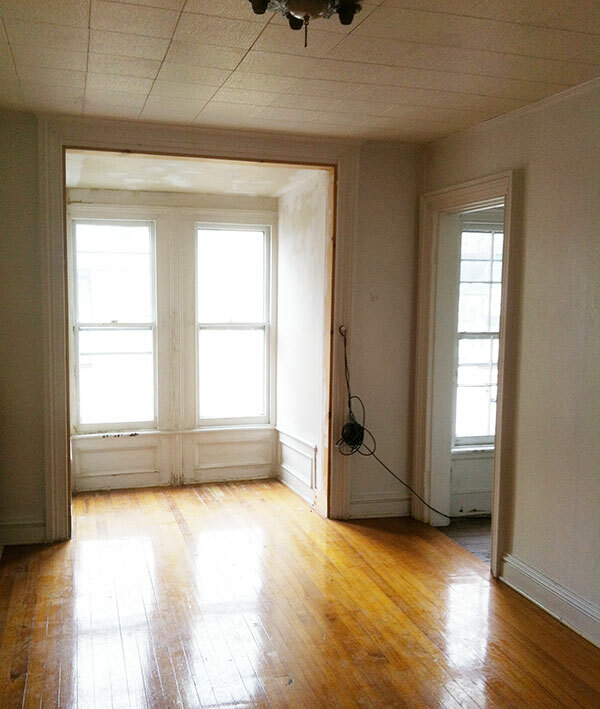 Curious why these three back rooms aren’t being used as a master suite and two front bedrooms as guest rooms? The awkward entrances really work as a master suite and are no longer awkward. Current den could still be den, ala master sitting room. Once it’s put back together, that’s definitely an option! I’m not sure that’s how I’ll use the house (knowing myself, I’ll sleep in both bedrooms just for the variety and because who the hell is stopping me?? ), just because that front bedroom is super nice but this back one…I don’t know yet! I think it’ll be very nice but it’s essentially a finished attic space with a dormer…so doesn’t really have the same grandeur as the front bedroom that I’m currently in. Anyway, yes—the option is certainly there! This sounds like a lot of ‘me too’, but I used to have that very dream, repeatedly. The room would be full of really cool stuff that I ‘forgot’ I owned. I used to plan what I would do with it. I always used to wake up really disappointed that it wasn’t true. Like you, it was when I lived in a one bed flat. They stopped when I moved into the house. Also, I have just painted the ceilings dark in two rooms of my house and I LOVE them. Obviously, it won’t work everywhere but I’ve found it’s made the biggest impact on the overall look. Especially if you have gorgeous crown mouldings and ceiling medallions. Really looking forward to seeing what you do. Yesssss! Your lady is gonna love that sofa. Nero is pissed and going through withdrawal. LOL. Poor senior dog, what shall he do? How shall he survive? Can’t wait to see what magic you work with the design. That middle room opening to the hall and other rooms is pretty common here in the Fan district in Richmond Va. So lots of variations on how it’s used. I have that dream where there are extra rooms. Sometimes with precious antiques. The opposite is the nightmare with squalid bathrooms I won’t begin to describe. I’ve been enjoying your blog for a few years now. Glad you are making some rooms comfortable for you and the pups while chaos reigns elsewhere. How about this……white or creamy white walls with a dark ceiling? I painted my dining room a creamy white and the ceiling Deep Space by BM and literally everyone who comes into my house fawns over it (and my unpainted chestnut woodwork!). Or a dark ceiling and wallpapered walls?? I’m loving CB2’s latest collaboration with Hygge & West. I guess I’m thinking that dark walls + dark ceiling is going to feel like a cave. Just throwing it out there boo. I think this room was a day nursery in the days when children were neither seen nor heard until they grew up. The bedroom off it would have been where the children slept and the day nursery was where they played and were taught by the governess/tutor. They would eat there too, hence the stairs to the kitchen. Where would you rather be . . . a day nursery or an opium den? You sneaky you! You actually gave us a peak in your Herman the bird insta! I love the color, so rich, can’t wait to see the whole TV unit you built out of lath, is the front the cross panel you made earlier??!! That Herman is such a sweet find. I think you should name this room the Ganja Den, unless you want to try some opium! And, when he says OPIUM den, he doesn’t mean complete with the opium. Just FYI. Also, if big cushy leather sofas are having a comeback and anyone is interested I have an enormous dyed through camel color Poliform with the wood bookend that is “L” shaped and the long side is 96 inches (making it way too big for our condo) and the seats are 44 inches deep. If you’re interested, let’s talk. It’s in storage. BTW, get that TV out of the bedroom, terrible habit. 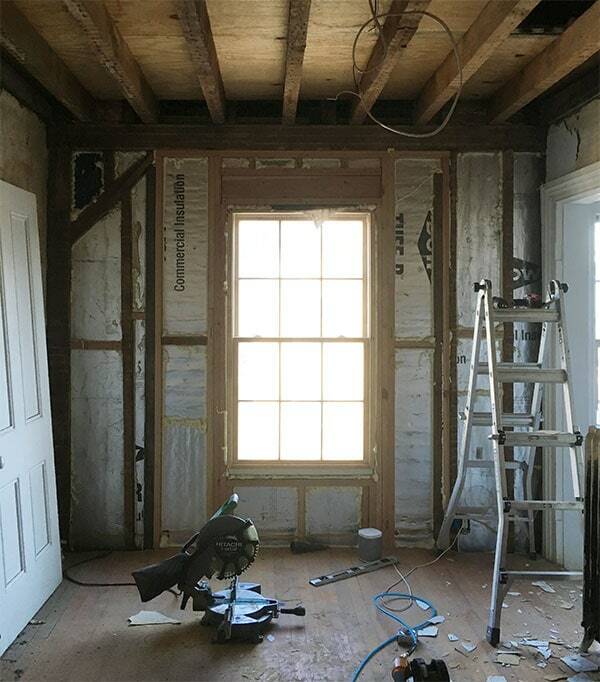 ← Den Renovation: Plaster Repair, Insulation, Drywall!